Welcome to BT Shawlands Clay Pigeon Shooting Club. 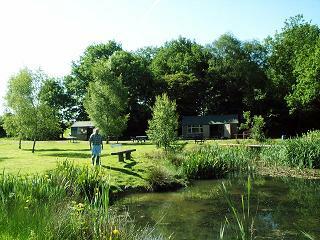 We are a small clay shooting club set in the beautiful village of Lingfield, Surrey. The club offers a safe and friendly environment to participate in one of the most exciting shooting sports in the world and caters for beginner and experienced shots alike. We have a coach available who can teach the basics of gun safety and techniques to the beginner at no extra cost. The club boasts a club house set in beautiful grounds with catering facilities, club guns, and a wide range of varying targets to test even the most experienced shooter. The club operates 2 shoots, the league and farmers shoots. The league shoot on the 2nd Saturday of every month is shot over 50 birds. Scores are counted thoughout the year towards the league results and trophies are awarded to the champions at the end of the year. The league shoot is only open to members of the club, however guests of members can also take part (although their scores will not be counted in the league). The farmers shoot takes place on the last Saturday of every month (except August and December) and is shot over 80 birds. The farmers shoot is a friendly shoot and the scores do not contribute to the league. If you are new and have not shot with us before, please contact a committee member before hand, or ask in the signing in hut. Both shoots start at 10:30am and the last rounds must have started by 12pm. The club was originally run for all present and retired BT employees and was part of the BT recreation society. It provided an opportunity for people associated with BT to try the sport at a subsidised fee. Today the club no longer gets any funding from BT, it is entirely self funded. It is open to all members of the club, plus guests and is aimed at both beginners and experienced alike. Although we do ask that if you are a beginner that you have a safety lesson first before we can allow you to shoot at our ground. The club has over a 100 members and runs 4 leagues, owns many automatic traps and a number of club guns. The BT Shawlands committee run the club on behalf of its members and all committee members contribute on a voluntary basis. Any profits at the end of the year are re-invested back into the club for the benefit of its members.